A slew of recent news related to airline and rideshare companies tapping into biometric identification—like fingerprints, faces, other unique body parts—seems like it just means an easier way to board your flight. But beyond the surface, giving corporations and the government this much access to sensitive data poses a major privacy threat. Yesterday, Delta launched a program letting certain passengers use their fingerprints as a boarding pass on flights at Reagan Washington National Airport. 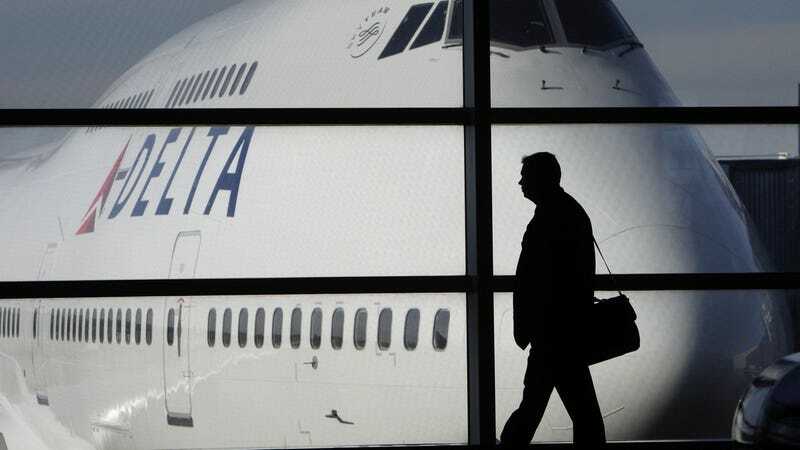 Delta boasts its biometric identification as a “more convenient customer experience,” and responds to positive customer and employee feedback. Delta, along with JetBlue, also introduced facial recognition earlier this year as a way to identify passengers boarding certain flights. Meanwhile, Uber, as well as its Indian rival Ola, may tap into India’s controversial biometric identification system to verify driver identities, according to sources close to BuzzFeed. Aadhar, the biometric system, is a centralized, government-controlled database filled with sensitive personal details of nearly 90 percent of India’s 1.3 billion people. Critics call Aadhar “Orwellian,” arguing it enables government surveillance and poses serious threats to privacy. This isn’t the first time the ride hailing giant took advantage of its users data; Uber literally created a tool called “God View” that targets drivers and competitors’ drivers, which continued even after Uber said it stopped. Similar to India, the U.S. has very few laws protecting the privacy of individuals’ biometrics. Only two states, Illinois and Texas, have laws that explicitly outlaw the practice. That’s why Facebook, Google, Snapchat and Shutterfly were all sued for violating Illinois’ Biometric Information Privacy Act through capturing and storing facial recognition data without getting consent from users. The risk isn’t just about what private companies can do with biometric data—the government has been tapping into biometric identification too. JetBlue’s program works closely with the federal government, matching passenger images to passport or visa photos in the U.S. Customs and Border Protection database. The Trump administration already announced plans to reshape airport security around facial recognition for both U.S. citizens and visitors. Government access to biometrics and other sensitive personal information could be costly. Congressman Jason Chaffetz suggested using facial recognition software to track undocumented immigrants. Biometric identifiers is already used as criteria for the No Fly List, or a airline terrorism-watch list that mostly doesn’t include any actual terrorists and, unsurprisingly, disproportionately targets Muslims. This all is to say: don’t let the line at JFK at 10 a.m. on a Saturday lure you into giving into the surveillance state.